Dr. Stephanie Ferguson recently gave a report to more than 240 global health leaders outlining recommendations for focusing future health spending. 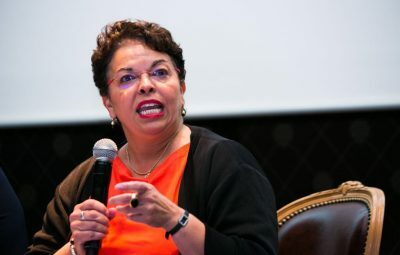 Dr. Stephanie Ferguson speaks at the World Health Assembly in Geneva, Switzerland, about recommendations for future United States global health policy. Dr. Ferguson, who returned to the University of Lynchburg nursing faculty last year, spoke at the World Health Assembly in Geneva, Switzerland. She shared the results of the Committee on Global Health and the Future of the United States Consensus Study, which recommends priorities for maximizing the potential of U.S. global health spending. According to the report, global health spending improves national security and economic development. The report recommends that the U.S. focus on investments that develop global health security, respond to the threat of communicable diseases, improve the lives of women and children, and promote cardiovascular health and prevent cancer. These priorities would be supported by actions such as combating drug-resistant bacteria, building public health capacity in low- and middle-income countries, and improving digital health infrastructure. Dr. Ferguson helped create the report as one of 14 experts on the Committee on Global Health and the Future of the United States beginning in the fall of 2016. She was nominated to that committee by the National Academies of Sciences, Engineering, and Medicine. The committee published the final report on May 15. The National Academy of Medicine selected Dr. Ferguson, along with committee member Giesla Abbam, senior vice president of GE Healthcare Worldwide, to present the report at the World Health Assembly. They also delivered the report to the World Health Organization Global Coordination Mechanism on Non-Communicable Diseases on May 25. For more details on the report and its recommendations, visit the National Academies press release and the report’s web page.